The Import to Outlook program for Excel enables the import of Excel data into calendars and contact information. The tool enables the import of appointments and birthdays from an Excel file. The Import to Outlook program for Excel solution is ideal for syncing devices such as multiple PCs, PDAs and laptops. It is also ideal for environments where not all participants of a project reside on the same network exchange. In exchange mode, up to 20 participants can be defined or in local mode just the user. The Excel file can contain birthdays and appointments ordered by date, start time, duration and reminder. The rest is handled by the Import to Outlook program. 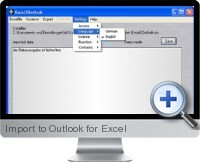 The export writes the appointments into the Outlook exchange calendar or local calendar. Previously imported appointments and birthdays can also be deleted.